First of all, it’s great to be reading your articles again! They were sorely missed. Hope you had a great break. I’m watching from New York and it’s interesting to watch the hometown tournament I grew up with from a foreign perspective. It was funny to hear Brad Gilbert refer to the Fanatics as “Hewitt’s fan group that also sometimes support Tomic”. Generally I’ve found ESPN to be MUCH better than Australian broadcasting. For example, yesterday 2 matches were in potentially match-ending tie-breaks; one was a non-camera court, so they sent a camera man to the crowd (even though the match didn’t feature an American) and proceeded to jump back and forward between the 2 matches. It made for very exciting viewing. And yes, they’re incessant about the heat too (of course, it’s always presented in some archaic metric and accompanied by an American geographic analogy). Nonetheless, the conservative media’s recent insistence that the conditions here of late (around -25 C last week) completely negate the theory of global warming have yet to be retracted. I’ve been really impressed with Tomic lately. Retirements aside, he seems a lot more serious and committed (screams of “Ajde” are suddenly common), and he’s even bulked up quite a bit. Let’s hope this continues and isn’t just another down-under spectacle! Interesting to hear about ESPN. Aside from the enviable comprehensiveness of the coverage, how have you been finding the commentary? The heat really is something else (brutal, searing etc). Black Saturday was worse (obviously), but this is more draining because it’s never quite bad enough not to venture out in, but once you’re out there you feel addled, and it just keeps coming, for days and days. Still, today I watched Federer play Kavcic on Hisense with the roof closed and air con blasting. Not many nicer ways to spend an afternoon. I admit I’ve given up hoping Tomic makes more of the other ten months of the season. His effort to return to the Sydney final was commendable, and he certainly seems to be committed, but I just don’t know. 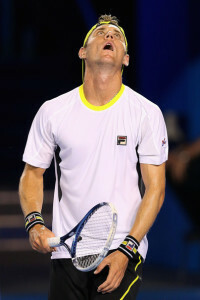 Cahill said he no longer feels certain Tomic is bound for the top ten. I’m inclined to agree. Good man yourself, JP, for the kind words you wrote for Tomic. He deserved them. Cheers. I felt it needed to be said. If people are going to lay into Tomic, at least do it for things he has actually done wrong, whatever they may be. I remember Black Saturday vividly. 46 C with a 2-day blackout. It was unbearable. Ironically though, that was the greatest Aus Open I’ve EVER experienced. Jealous of your Hisense experience! Wasn’t Federer amazing?! Good to see his new racquet is giving him a stronger BH without compromising too much on his excellent touch. Of course, let’s wait and see if the same can be said when he plays tougher opponents. I’ve been very impressed with ESPN commentary. Of course, they’re American commentators, so they never shut up. But I actually like this style. They’re very knowledgeable, not only about tennis in general but specific players (even the more obscure ones), match-ups, playing conditions, racquets, and so on. They really put the Channel 7 commentators to shame. With Cahill, Frew, Pat McEnroe, Evert, Mary Joe and Gilbert (whom I actually really like), you can’t go too wrong. I’m very impressed with their knowledge of the Aussies too. They spoke at length about Tomic, with accuracy and insight (even when Cahill wasn’t there). Although I suspect Cahill feeds them most of their info; having him spearhead the Aus Open commentary was a very wise move. They were all really impressed with the K Kids: they’d actually seen them play before the Aus Open, and/or had learnt about them (I get the impression these commentators do their homework). Interestingly they said the rise of Kyrgy and Koko (Here’s hoping these will catch on!) will be nothing but good for Tomic: it’ll show him he’s not special anymore, and needs to work hard if he’s to win the Aussie spotlight. Actually I suspect it’s more than just that: he’s so used to being top-dog in Aus (a friend of mine played him in national comps and said he was unbeatable, if not also a total jerk) that some competition for being the best Aussie will be compelling for him. Glad to see the nicknames – Kyrgy and Koko – was already worried about learning how to spell their names. If their play at the AO is any indication of their talent, we will be talking (and writing) about them a lot in the future. The future certainly looks bright. I’m actually interested to see where their paths will diverge (if ever). It’d be kind of nice to seem them rise of the rankings in lockstep from here, less a doubles teams than a singles tag-team. As any Herald Sun “journalist” will doubtless agree, your post is pure genius! Thank you. Sadly, no Herald Sun journalist can offer any opinion unless it is pre-approved by the Murdoch mothership. But thank you, Eva.